Gerald Mitchell was executed in Texas on October 22 for a shooting and robbery he committed when he was 17-years old. (Associated Press, 10/23/01) This is the 18th execution of a juvenile offender since the death penalty was reinstated and the only one this year. Texas has accounted for more than half of the juvenile offenders executed in the U.S. since 1976. In the past 2 years, only Texas and Virginia have executed juvenile offenders, and Virginia currently has no such offenders on its death row. The Virginia Supreme Court recently overturned the death sentence of the only juvenile offender on Virginia's death row. The court ruled that Shermaine A. Johnson's death sentence should be vacated and he should receive a new sentencing trial because his jury was not told that Johnson would not be eligible for parole if sentenced to life imprisonment. The state attorney general's office acknowledged that Johnson's jury should have been told that a life sentence really meant life. (Washington Post, 9/25/01) Last year, the only other juvenile offender on Virginia's death row, Chauncey Jackson, had his conviction overturned. The state decided not to pursue the death penalty at his re-trial. Napoleon Beazley was granted a stay of execution by the Texas Court of Criminal Appeals just hours before his scheduled execution. (Associated Press, 8/15/01) Beazley, who was 17 at the time of the crime, would have been the 18th juvenile offender executed since the death penalty was reinstated, and the 10th juvenile offender executed in Texas. Read the report, "United States of America: Too young to vote, old enough to be executed." 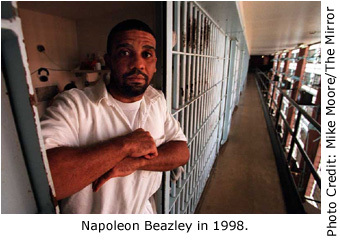 For more information, see the American Bar Association's Juvenile Justice Project's Web page on Napoleon Beazley. Antonio Richardson, who was scheduled to be executed on March 7, 2001 in Missouri, was granted a stay by the U.S. Supreme Court. Among those trying to prevent his execution is Ginny Kerry, mother of the murder victims, who asked the Governor to spare Richardson's life. Richardson, who was 16 at the time of the crime, was originally offered a life sentence in exchange for a guilty plea. Pressured by a local activist, Richardson rejected the plea and was convicted. Richardson's lawyer had never participated in the penalty phase of a capital trial, and failed to present expert testimony as to Richardson's mental retardation and brain damage. When the jury deadlocked on whether or not to impose the death penalty, the decision went to the judge, who sentenced Richardson to death. Currently, a bill is pending in the Missouri legislature to exclude the mentally retarded from execution. (American Bar Association's Juvenile Justice Center, Execution Alert, 2/15/01). For more information on Antonio Richardson and his case, including recent news articles, please visit the ABA Juvenile Justice Center's Web page at www.abanet.org/crimjust/juvjus/richardson.html.